In case you haven't seen THIS new Verve set, you better go and check it out! It went on my favorites list in a super fast hurry! I am so loving these flowers and the leaves! Oh AND the sentiments! I was really excited to win the Mojo Monday contest HERE and I won a stamp set of my choice! This was the one for sure! I am sitting here amongst a sheet rock mess! Our basement remodel is coming along! My dd is sooo exited about her new room! And I am kinda over the moon about my new craft room too! I am thinking about colors! I can't decide! I think we are going with white trim down here so most likely I will pick white cabinets! Maybe a green room with red accents! If you know me, you know I love red so that is a MUST in the room! My room now is black and red! I am thinking because black shows so much dust that the black is going to go! I will post picks as I have some new ones! So I am off to get some cleaning done! I have to make somewhat of an attempt at maintaining the dust. Boy is that a chore! I want to wish you all a Happy Easter! We have spent time coloring eggs, being crafty with my dd, going to an Easter Egg Hunt! Today we are going to go to church and probably hunt some more eggs! Easter is one of my favorite times of the year! I am reminded of the resurrection and how Christ died for us! He has blessed my family and I in so many ways! I am excited to teach my kiddos about his love for us and to make sure they know the Easter story! I hope you all have a blessed day! He is risen!! This is gorgeous, Laurie! I didn't get this set (yet! ), but I do love it. I really like your layout, too. The way the black peeks out the side is really cool. This is gorgeous! Love those colors, Laurie!! Wow! You have tons to be excited about...can't wait to see pics of your new rooms! Love this card...gorgeous! And I have this set...feel a case coming on! really pretty!! love the sentiments in this set. This is so pretty. The pink is so soft and you have the pefect amount of black to make the whole thing just perfect! Enjoy your Easter! Way to flash some Verve!! Love the card :) Permission to case?! Your new rooms sound wonderful too. Have a blessed Easter! My son and some of the youth are in a God Rod performance as part of the Easter Performance at the church and are doing the choreographed routine with the God Rods to Arise My Love. Totally powerful! I'm going to be a mess watching it tonite as he has the leasd. I agree, Easter is such a fabulous time of year and it humbles me to know how much Christ loves me, warts and all :) Blessings! Laurie this is so pretty. Love the new stamp set. Have a wonderful Easter. Great dimension in your card, it's beautiful! Happy Easter Laurie! Happy Easter Laurie! Your card is so pretty! Love the leaves and those flowers are so fun! Great work! Such a beautiful card Laurie. I like the simple black edges. Verve has the BEST sentiments ever don't they? Beautiful card! The colours are so pretty & i LOVE the pearly centers. 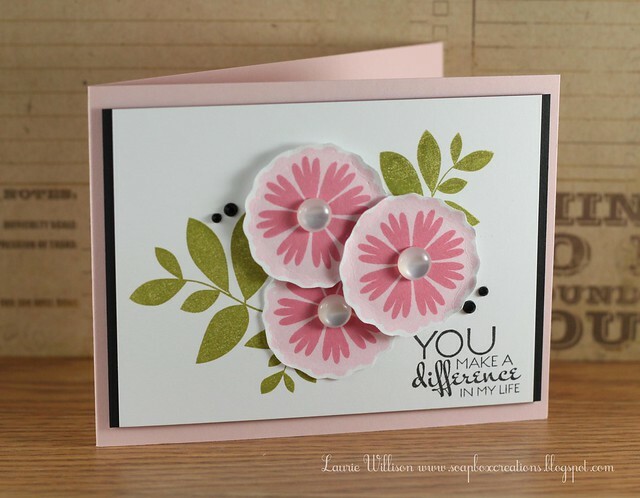 How beautiful Laurie..love the softness and elegance of this card..stunning..hugs sweetie! What a pretty card, Laurie. Love this card! I do love Verve stamps and this set is awesome. Easter blessings to you Laurie! WHY WHY WHY ?? Why what ...... why must you ALWAYS enable me?? So tell me little Miss Sunshine ...... why do the dies have the small circles coming off the sides?? You know you have to explain it all to me because I am challenged with the whole blonde thing. Love the softness of this beauty. 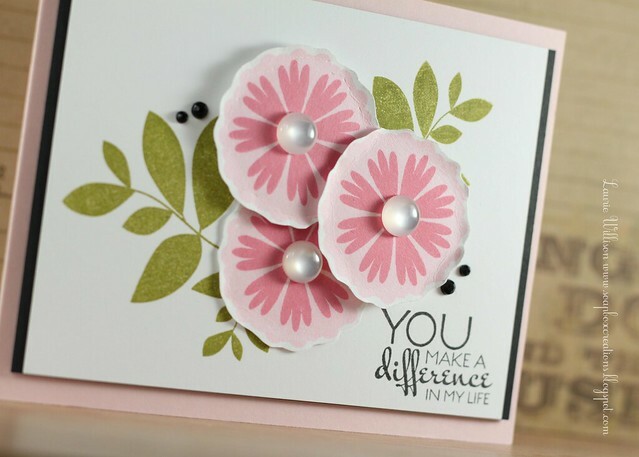 You make the difference in my life ....... you make me a better crafter!!! And CONGRATS on the Girl Friday gig ....... I know you will ROCK IT Girly Girl!!!! So pretty! I love the black strips down each side, that highlights the card so much! I also really like the double stamped flowers and the black pearls. That sentiment is awesome too! Eeek! I love love love that card! the matting on just the sides...genius. It's those out of the box things that I *never* think of. I get so much inspiration from you girl!!! The pic of your kiddos is way too cute. So nice to see your family. Can we see pics of your new craft room/remod when it is all finished? I love this card! The Pink/Black combo is perfect, and the flowers are just lovely! Beautiful card! Such a beautiful card, girl! LOVE the way the pink just POPS on all that soft pink! Ooops! I meant how the black just POPS on all that soft pink! LOL! I'm exhausted! Love this card...those black accents just pop! I held off on getting this set in the most recent release because other things came 'ahead' of it on my list...but it's still on my list!